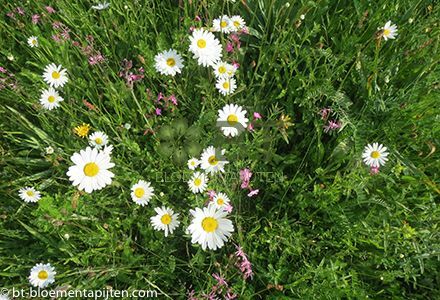 Wildflower Border Turf has been developed by the company to provide a highly colourful, low maintenance and cost effective alternative to conventional garden flower beds. It is weed suppressing, easy to handle and delivers a guaranteed colourful flowering environment. The border mix has been specifically designed to extend the flowering season with a variety of colour throughout the season. The turf is made up of 33 UK native wildflowers and grasses, with the addition of approximately 19 non-native perennial flowers. To produce this environmentally beneficial product, every effort is made to source sustainable ingredients, for example composted green waste and organic nutrients, as well as carefully monitoring all inputs such as electricity and water. The turf naturally produces a bio-diverse habitat supporting birds, mammals, bees, butterflies and other invertebrate species. A non-native Wildflower Turf suitable for a range of soil types. A highly colourful, low maintenance and cost effective alternative to conventional garden flower beds and borders. Garden and urban applications from 30m² to 1,000m². Low Maintenance – one to two cuts a year. Cutting Cycle: Once every autumn (Summer cut optional) Watering: For the first 2 weeks to prevent turf from drying out. After which just the odd soak in long periods of dry weather.